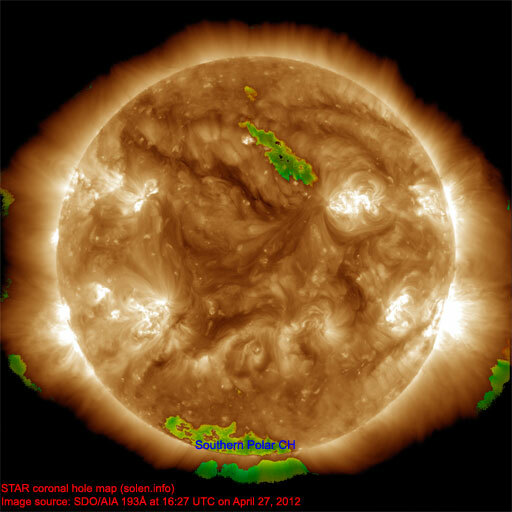 Last major update issued on April 28, 2012 at 05:50 UTC. 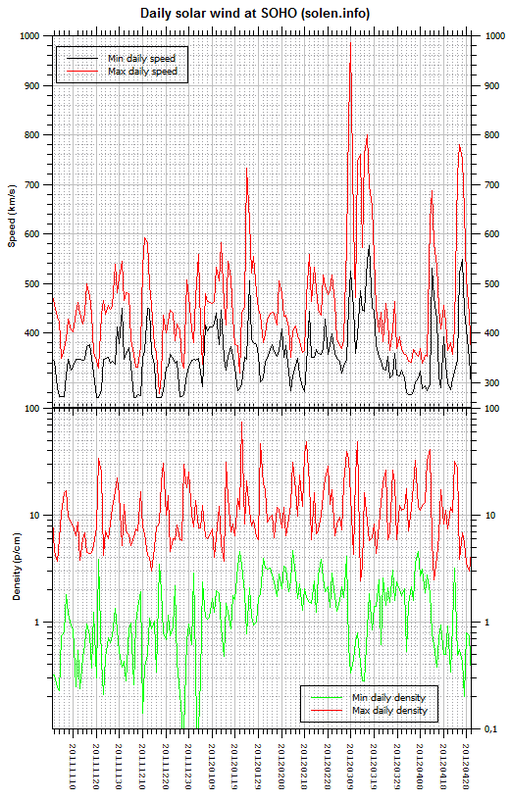 The geomagnetic field was quiet to unsettled on April 27. 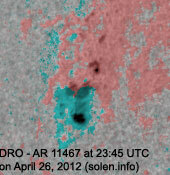 Solar wind speed at SOHO ranged between 444 and 646 km/s. 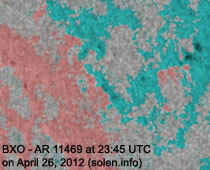 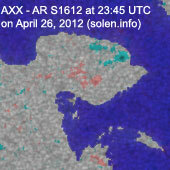 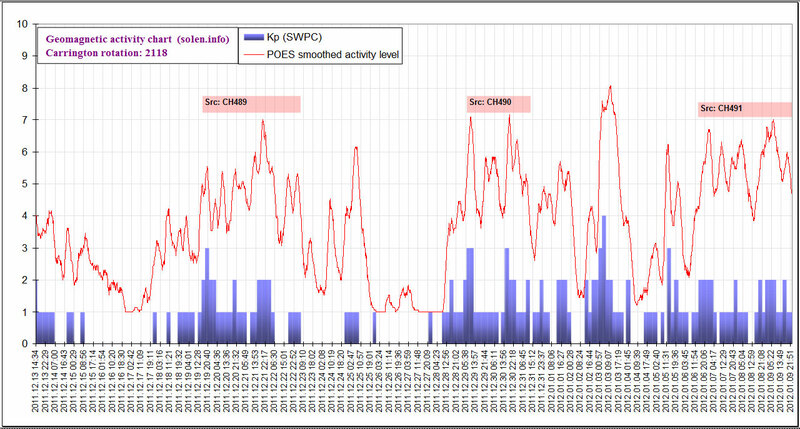 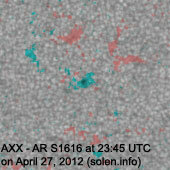 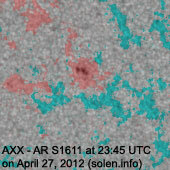 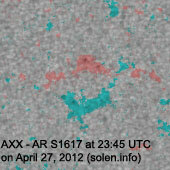 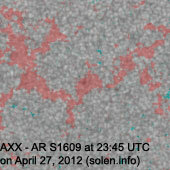 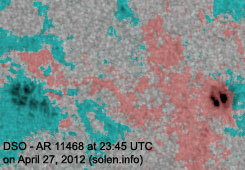 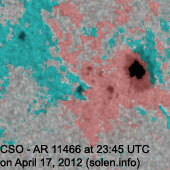 Solar flux measured at 20h UTC on 2.8 GHz was 117.6 (increasing 7.5 over the last solar rotation). 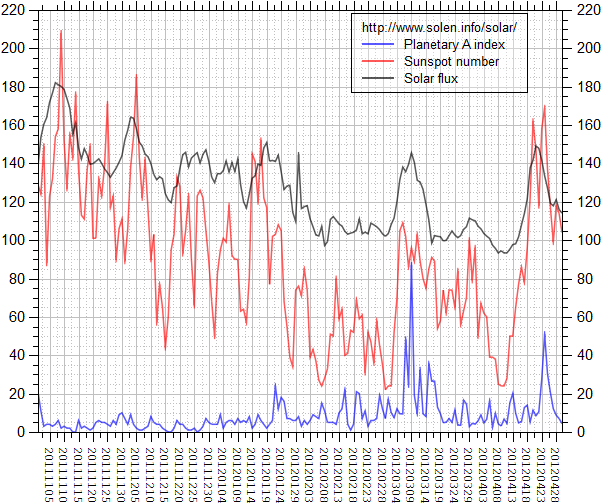 The Potsdam WDC planetary A index was 10 (STAR Ap - based on the mean of three hour interval ap indices: 10.1). 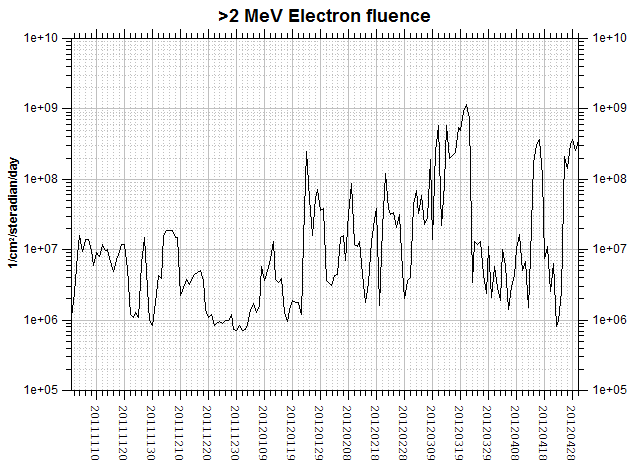 Three hour interval K indices: 33312123 (planetary), 32212223 (Boulder). 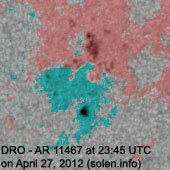 Region 11468 [N10W29] decayed slowly and quietly. 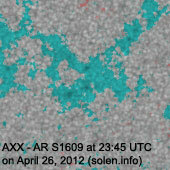 S1609 [S25W14] lost the leading polarity spots and gained a tiny spot in the trailing polarity area. 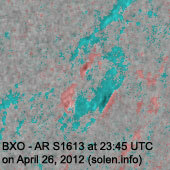 S1611 [S26E30] decayed slowly and quietly. 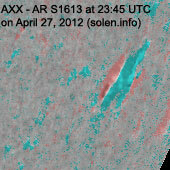 S1613 [S25W73] decayed slowly and quietly. 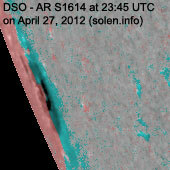 New region S1614 [S23E83] rotated into view at the southeast limb. 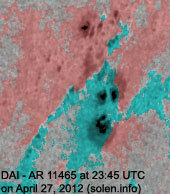 While difficult to observe near the limb, there could be a small magnetic delta in the leading penumbra. 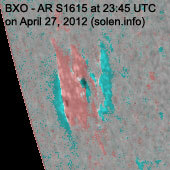 New region S1615 [S16E77] rotated into view at the southeast limb with two small spots. 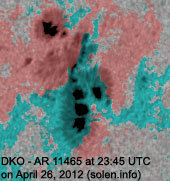 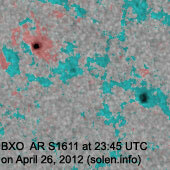 New region S1616 [N04E09] emerged at a low northern latitude near the center of the visible disk. 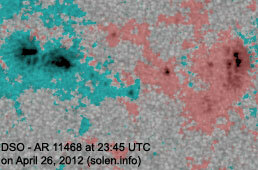 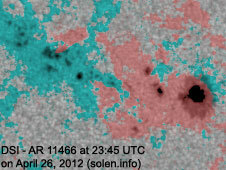 New region S1617 [N30W02] emerged at a fairly high latitude in the northern hemisphere. 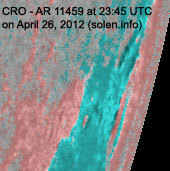 April 25-27: No obviously Earth directed CMEs were observed in LASCO and STEREO imagery. 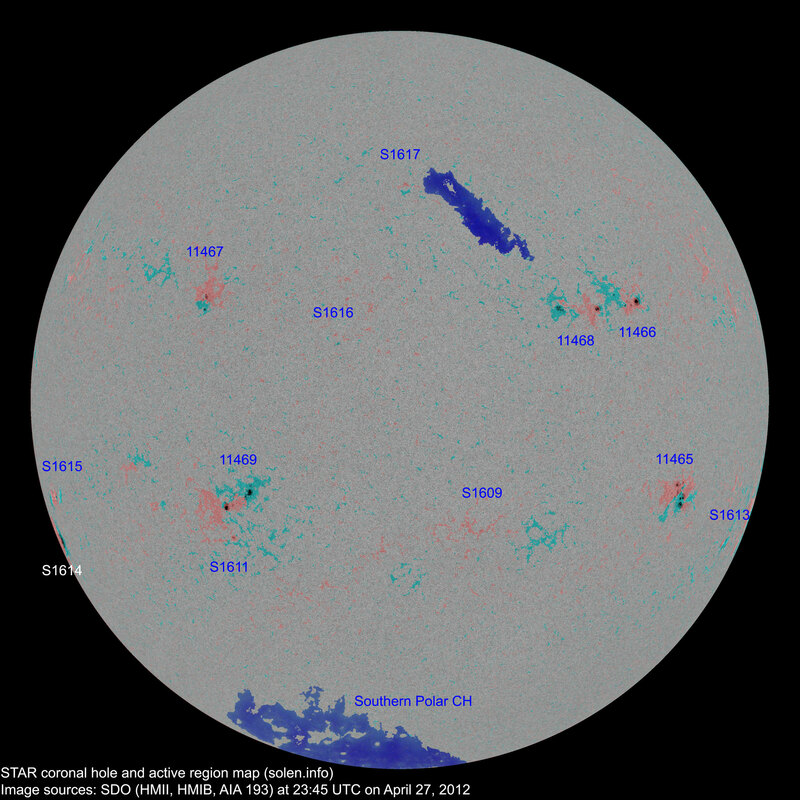 The geomagnetic field is expected to be quiet to unsettled on April 28-30. 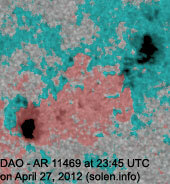 S1614 2012.04.27 4 1 S23E83 0160 DSO beta-gamma-delta?